For a musical form which valued improvisation and individuality, the Jazz world managed to produce some incredibly polarizing characters. Some artists find themselves persecuted by their peers for departing from the "purity" of Jazz, but how can one judge what is a departure and what is an innovation? of Brass". Born in Wichita, Kansas, 1911, Kenton grew up in Colorado before his family settled just outside of Los Angeles in Bell, California. Stan received piano lessons as a child, and by the time he graduated from Bell High School in 1930 he was working for several local dance bands. From the time he began performing professionally, it was obvious his temperament would make him a bandleader. 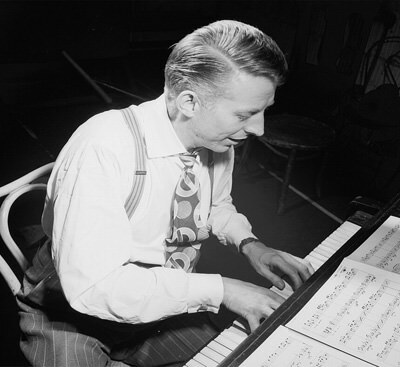 The first Stan Kenton Orchestra was formed in 1941 and spent the summer playing at the Rendezvous Lounge in Balboa Beach. He got what could have been a big break when his group was hired to appear as Bob Hope's band on the radio for the 1943-1944 season, but it seems to have been an unhappy experience for all involved and the job went to Les Brown. Things began to turn around when Kenton signed with newly formed Capitol Records in late 1943 and had a hit with "Eager Beaver". By the end of the War, Kenton's outfit was one of the most popular bands playing on the West Coast. The "Big Band Sound" was beginning to wind down, and Kenton found that he was happier leading a concert orchestra than a dance band. His "Wall of Brass" stylings gained popularity, although at least one critic complained, "There is a danger of an entire generation growing up with the idea that jazz and the atom bomb are essentially the same natural phenomenon." He kept adding horns until, by the time Capitol released Innovations in Modern Music (1950), the Stan Kenton Orchestra was a 39-piece outfit with strings, a woodwind section, and two French horns. The album "swung despite the weight" of its huge staff, and afterward, Kenton trimmed back to a more reasonable 19-piece orchestra. This was basically the outfit he worked with for his Concert in Miniature series on NBC. The Concert in Miniature series of band remotes began in the spring of 1952 and followed the Stan Kenton Orchestra on the road until the end of 1953. 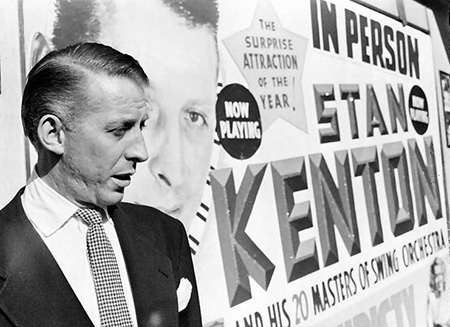 The series occurred during what is considered Kenton's most swinging period, and the music was considered "bombastic and unpredictable" but always maintained the Stan Kenton sound. Kenton's next big experiment came from 1960-63 when he built the band around a four-piece mellophonium section. Musically, the mellophonium is designed to take French horn parts in marching bands. The instrument uses less tubing than the French horn and appears similar to a large trumpet, its forward-facing conical bell being better suited for marching ensembles although mellophones are notoriously difficult to keep in tune. Nonetheless, Kenton cut 11 albums featuring the mellophonium section, two of which, Kenton's West Side Story (1961) and Adventures in Jazz (1961) were Grammy Winners. After 1963, Kenton began working less and less with big name Jazz musicians and dedicating more time to encouraging Big Band music at the high school and college level. While on tour in Reading, Pennsylvania, in 1977, Kenton suffered a fall which resulted in a skull fracture. On August 17, 1979, he entered the hospital after a stroke, and he passed away on August 25 at the age of 67. A Star on the Hollywood Walk of Fame at 6340 Hollywood Blvd is dedicated honoring contributions to Recording by Stan Kenton. Be the first to comment on "Concert in Miniature"